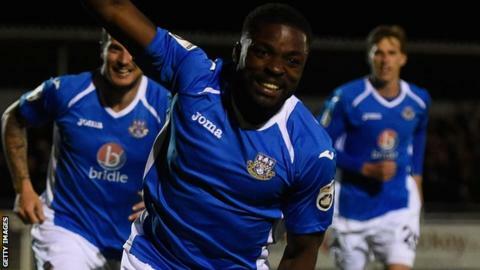 Yemi Odubade's late goal ensured a point for Eastleigh at Altrincham. Jamie Lawrie gave the home side a first-half lead as he arrowed a shot into the top corner from distance. James Constable had two chances to level but shot over the bar and had an effort saved by Tim Deasy soon after. Odubade ensured the Spitfires did not suffer a third successive loss as he volleyed into the top net as Eastleigh slipped out of the play-off places after Woking's win at Forest Green. Match ends, Altrincham 1, Eastleigh 1. Second Half ends, Altrincham 1, Eastleigh 1. Substitution, Eastleigh. Chris Todd replaces James Constable. Goal! Altrincham 1, Eastleigh 1. Yemi Odubade (Eastleigh) right footed shot from outside the box to the top left corner. Substitution, Altrincham. Sam Heathcote replaces Jordan Sinnott. Attempt missed. Lee Cook (Eastleigh) left footed shot from the left side of the box misses to the left. Attempt saved. James Lawrie (Altrincham) right footed shot from the centre of the box is saved. Attempt blocked. James Lawrie (Altrincham) right footed shot from a difficult angle on the left is blocked. Attempt missed. Will Evans (Eastleigh) right footed shot from outside the box misses to the right. Attempt blocked. Lee Cook (Eastleigh) right footed shot from outside the box is blocked. Substitution, Eastleigh. Jack Midson replaces Ross Lafayette. Substitution, Eastleigh. Yemi Odubade replaces Dan Harding. Lewis Noice (Eastleigh) wins a free kick.